This was published in the March 25th edition of the Kings County Record. A recent trip to explore land conservation models left me feeling something different and I tried to convey that feeling through this piece. I like the way it came out and feel that I'm not the only one that shares these feelings; either in someone's home or in new woods. I hope you enjoy it. When you walk into a friend’s home for the first time you experience a feeling of discomfort. There is a mix of curiosity and desire to be respectful that tend to battle one another. You want to sneak into the bedroom and see if the dirty clothes are picked up but you don’t want to infringe on your friend’s right to privacy. When you walk into unfamiliar wilderness, the feeling might be similar. I was investigating a new model for watershed conservation near Woodstock, NB recently and I experienced this feeling. The Meduxnekeag River Association (MRA) has successfully established a number of conservation forests along their river. One such conservation area is the Bell Forest where I met with a group of grade three students from Centreville. Simon Mitchell and George Peabody, Program Coordinators for the MRA, were going to lead the group, including me, through the snow clad forest. Immediately, I felt different, almost relieved, because I had no responsibility here. Everyone trekked up over the snow bank that separated the forest from the roadway. I went last and took my time as George and Simon provided the students with some educational tidbits. I could hear a woodpecker off in the distance and observed a few black capped chickadees. This piqued my interest and I decided to wander away from the group a little, I guess you could say I was looking for dirty laundry. After a few minutes on my own I navigated back to the group and listened to the grade three students answer questions that Simon put out to them. Instantly there was an urge to compare the students from Centreville to those in the Sussex region. In essence I was comparing my kitchen cutlery to that of my friends. Just so you know, my cutlery was just as nice. Comparing the linens might have been me comparing the trees and here I felt a bit conflicted because there were stark differences between the households. Bell Forest is rich in Acadian species and where I normally trek is mixed forest, so again I was feeling a little uncomfortable. The group made its way down the slope, in your home this might be the stairway, towards the river. The way the topography of Bell Forest literally stepped down towards the river and made me feel like I was heading to a finished basement. The hills around the Kennebecasis watershed might be more like an escalator to an open storage room. Every home is great for its uniqueness and I was starting to separate the Meduxnekeag from the Kennebecasis as I became more familiar with the Medux. See, I’m now at a nickname basis with it. The hike for the grade threes ended and Simon and I took some time to drive around the watershed. This was more like going through the drive-thru of a new restaurant or coffee shop. The distance from the ordering post to the pick up window is much shorter at the Meduxnekeag River than in the Kennebecasis. Regardless of the size however, the scenery was as rewarding. Large hills, rock ledges, rapids and waterfalls, and some diverse wetlands, all fed my hunger and left me feeling satisfied. Looking at someone else’s home can often make you realize how nice your own home is or how unique it is. We all need to change our perspective from time to time to appreciate what we have and this trip provided that. 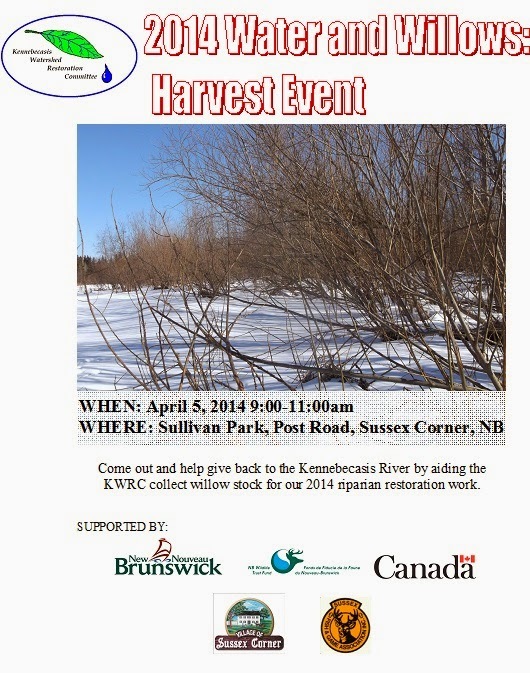 If you like the Kennebecasis River and want to help keep the dirty clothes hidden then come out to Sullivan Park on Post Road on April 5th from 9 to 11am to help the Kennebecasis Watershed Restoration Committee harvest some willows that will be used for future restoration work.